If you’ve come directly to this page on my website without reading the homepage – I forgive you. I know that not everyone has the time to read through lots of text in order to find the information they’re looking for, and that’s why among other snippets of information I’ve decided to add this page to my little creation. You should at least know that my site is essentially a collection of induction cooktop reviews. However, as with everything in life there are advantages and disadvantages to any product. Because I’m a normal person (well, some might say not but that’s another story), I’m not in the business of attempting to sell you something you might not need. Although my reviews are based on induction cooktops, it’s only fair I point out the pros and cons in case you’re still undecided if this is the right way forward for you in the kitchen. So, let’s start with the good stuff. When you use a cooktop that works with induction, you get instant heat. Now you might be thinking you already get that with gas but it will surprise you to know that induction cooktops can heat a pan of water far quicker than gas simply because of the technology they use. Staying with heat for the moment, you will also find with induction technology that there is no waste. You see an induction cooktop will only heat the cookware and not the whole surface. In fact, this type of cooking technique is up to 70% more efficient than either conventional electric or gas. Safety is an important consideration when you’re cooking especially with children around, and this happens to be one of my favourite features with induction. When you take the pan off the burner, the unit will automatically switch off, and in most cases you can touch the burner seconds afterwards without burning yourself. This safety feature is also great when you are cooking because as anyone with kids will know, they can get a little curious when you’re putting together a tasty dinner. 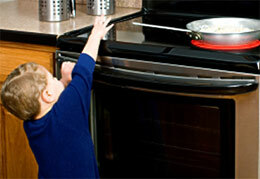 If little fingers do happen to touch the cooktop, they won’t get burnt. Cleaning a cook top can be one of the biggest headaches, and I speak from experience with this one. With traditional electric or gas hobs it’s impossible to avoid food being baked on to the surface. Not only that, traditional gas cooktops have lots of places where food can hide. With an induction cooktop this isn’t the case. Food cannot become baked on because the surface is cool, and cleaning can be as easy as wiping it down with a damp cloth. Looks for some are important, and although last on my list of pros this deserves a mention. Induction cooktops have gone one step further in terms of design, and many of them blend into the décor of your kitchen seamlessly. It’s not the most important point to mention, but if you spend a lot of time in the kitchen having a nice environment to work in really helps. Well, I think so anyway. 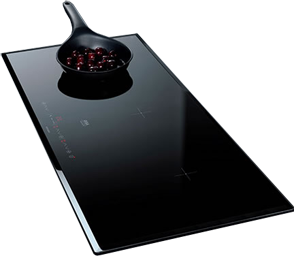 Now I’ve dealt with the good stuff, it’s time to let you know about some of the negatives with induction cooktops. Induction cooktops will cost you more to buy than traditional electric or gas. However, you have to think about the technology that goes into building them. You also have to consider how much quicker you can cook any type of dish, no matter how complicated. Add to that the savings you can make on your energy bills, and the chances are your initial outlay will pay for itself. Cookware is an issue I come across all the time, and there are many people who think they will have to buy a completely new set of pots and pans. The trouble is not everyone understands that all you have to do is make sure a magnet will stick to the base of your cookware. If it does, it will work with induction. However, there are cases when you will have to replace some items. Power can be a bit of an issue. If you have an outage for some reason, you won’t be able to cook (unlike with gas). Also, you must make sure you’re careful when looking at the wattage any induction cooktop offers you, especially if it has more than two burners. Some models only have the ability to evenly distribute the power, so if you’re using both burners on a total wattage of 1800 you will get 900 per burner. That said I have got reviews from manufacturers who have dealt with this problem. Now you know all the pros and cons, I will leave it up to you to decide if you think induction cooking technology is right for you. Of course, you’re more than welcome to have a scout around my website to see what’s on offer. There has been quite a bit of buzz lately on whether or not electromagnetic induction poses a hazard to people with pacemakers. While the experts are not unanimous in their opinion, I would recommend you to stay on the safe side and NOT buy an induction cooktop if you have a pacemaker.